The following case study provided by Solberg Filtration. 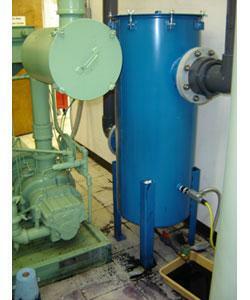 A rotary screw vacuum pump, located on the process floor, is used as a central vacuum system. The pump removes any residual inks from the spent cartridges to prepare them for recycling. The ink needs a point of collection, that can provide for easy removal and filtration, to protect the vacuum pump from ingesting any ink that might contaminate the lubricating oil. The enduser had been using a series of pneumatic paint pots to collect the ink. This process was inefficient and the vacuum pump OEM would not approve the pump warranty extension while this occurred. Solberg reviewed the whole process. The specific capacity of the vacuum pump was reviewed, along with the history of liquid collection to insure the adequate flow and collection capacity of the ink. During the review, the enduser also wanted a method to automatically remove the collected liquid ink. Solberg recommended the SRS Series to removed the liquid ink as well as provide filtration. Solberg also recommended a solenoid valve system set up in a series to remove the liquid. The unit was installed in the equipment room instead of on the process floor; this helped consolidate space and provided easier access for maintenance. The customer was appreciative of the fact that Solberg was willing to do an onsite inspection of the application and offered other space saving and cost saving suggestions as well. The vacuum pump warranty extension was approved and the improvements simplified the maintenance process significantly. Need Viking Pump Product Specifications ? Water System Legionella Risk Solved!